Can I Talk About My Emotions With My Girlfriend? Family members having a discussion around the kitchen table. 1 Can I Talk About My Emotions With My Girlfriend? A family member is usually the last person you'd expect to gossip about you. Your relative is supposed to have your back, not be the one backstabbing you. 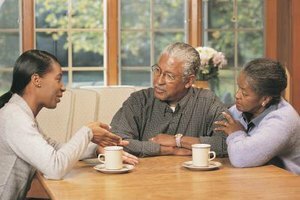 Try to take a deep breath and talk to your family member – there might be an underlying issue that the two of you can resolve. When your sister lets you know about the malicious rumors your cousin has been spreading throughout the family, resist the flames that start to spread throughout your body. Don't sink to her level and engage in the hurtful and childish behavior – you’ll appear no different than the offending relative and it won’t satisfy your wounded pride, explains Ben Fuchs in the article "Betrayal, Revenge & Forgiveness: A Life Initiation." Furthermore, you don’t want to involve any more members than necessary to avoid inciting a family war. Instead, give yourself some time to cool off and then arrange a get-together with the offending family member to get to the root of the problem. While at first glance it might look like your relative is spreading rumors to your sister, uncle Bob and cousin Jim for no reason, her malicious actions might not be entirely unfounded. Talk to her about why she’s acting in this manner – be clear and speak plainly, and then be open to listening to what she has to say. Perhaps you offended her unwittingly or she might be jealous of your relationships or career success. However, your relative might not hand over this information quite so willingly and when questioned might quickly become defensive. To make it through the conversation and get to the root of the problem, stay calm and cool in the face of her negative reaction. If you discover that resentment has been building over the years – perhaps you’ve become the star to which your aunt compares your cousin on a regular basis – you can have an open discussion about her hard feelings. If there has been an unresolved altercation between the two of you, consider offering an apology for hurting her. While her backstabbing activities aren’t justified by your perceived previous wrongdoing, if you played a role in causing your family member to feel hurt or offended, you can begin to heal the relationship by showing that you are apologetic. Now that you’ve gotten to the underlying issue that caused your once-doting uncle to spread vicious rumors behind your back, let him know that you need this behavior to stop. If the backstabbing continues after your discussion, don't sink to his level and engage in malicious talk behind his back – remove yourself from the relationship. By spending less time with your relative, you provide less fuel for the fire – less gossip for him to spread – and it provides you both with a cooling-off period. Now it's up to him to come to you to repair the relationship. If he is interested in reconciliation, he'll have to cease the negative behavior and apologize for the hurt he has caused. If you've tried everything you can fathom and the relationship is irreparable, you may need to withdraw from it all together. Let your family member know how you feel and that you no longer wish to communicate with them. While you might feel guilty or pressured to maintain the familial relationship regardless of the emotional cost to you, stick to your plan and rely on the positive and healthy relationships in your life for support. If you find yourself struggling with guilt and other negative feelings, talk about the issue with a therapist or other mental health professional. How to Deal With Your Boyfriend's Crazy Ex-Wife?